A desktop magazine rack is essential for keeping a counter or receptionist's desk arranged & clear. The display rack, desktop magazine rack should be able to hold a large amount of flyers yet still showcase different covers or titles of your magazines. A desktop magazine rack, also known as leaflet display holders, should also make it easy for clients to browse through a selection, without having to reorganize or pull out a pamphlet. For this reason, we've provided the desktop magazine rack with a rotating design. 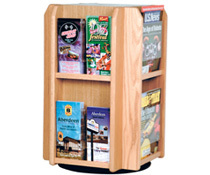 Clients can simply spin the desktop magazine rack around to find a ideal brochure or magazine. 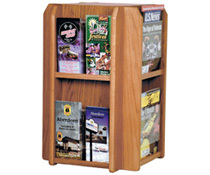 A desktop magazine rack, made from solid wood, helps to create a professional-looking yet warm presentation. Wood furniture, in general, creates a more inviting & friendly atmosphere while its individual pocket design helps to keep literature arranged, ultimately presenting your business in a positive manner. 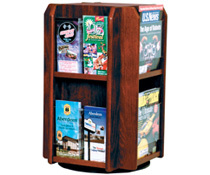 The rotating brochure holder, desktop magazine rack is even available in three different wood finishes: Red Mahogany, Medium Oak & Light Oak. Finally, the brochure holding fixture features adjustable pocket for holding both 4" & 8.5" wide literature. Countertop magazine files can be found in a variety of locations to help distribute informational pamphlets & takeaway brochures. From hotel lobbies & bank foyers to corporate environments, such as on a receptionist's desk, you are sure to find spinning literature and brochure racks of varying sizes & styles through our site. Displays2Go offers hundreds of different multi-pocket magazine display products, in floor-standing, countertop & wall mounted designs. We even offer wall mounted magazine files you can also position on a counter!